Earnings season is winding down. Overall, the tone of the earnings reports has been positive. According to FactSet, as of Friday, reports from more than 90% of the companies in the S&P 500 had been released. An above average 73% of those companies beat expectations. Although few analysts do so, all earnings data should be placed in context. Saying that 73% of companies beat expectations sounds like it’s good. But some context would help readers understand what this number actually means. Over the past five years, 68% of companies have reported earnings per share (EPS) that were above analysts’ expectations. This quarter’s results are just slightly above average by that measure. The average earnings beat has been 6.1%, which is also above the average of the past twenty quarters which is 4.1%. It seems reasonable to expect that traders will often buy stocks after a company delivers a better than expected than earnings. In fact, on average, stocks do generally see a gain as traders absorb the news. This can be demonstrated with data. 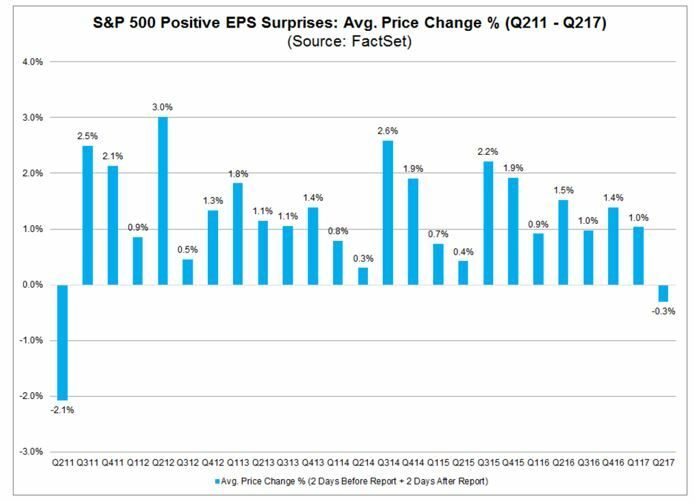 Over the past five years, companies in the S&P 500 that delivered a positive earnings surprises have enjoyed an average gain of 1.4% during the four trading days that begins two days before the earnings announcement and ends two days after the announcement. This quarter, we have seen something different. Companies in the S&P 500 that reported positive earnings surprises have suffered a small selloff, declining 0.3% on average during those four days. This will be the first time we have seen markets react that way since 2011. In 2011, that earnings season preceded a sell off in the stock market. Selling began in late July and continued into October. As the chart below shows, losses were substantial with the Dow Jones Industrial Average dropping nearly 18%. The biggest sell off came in Pioneer Natural Resources which dropped 16% despite beating expectations. Eight other companies suffered double digit losses after beating expectations. This indicates individual stocks are experiencing greater than average volatility even when they beat expectations. This is unusual behavior and traders can develop strategies when they notice something unusual happening in the market. Although more than 90% of earnings are in, there are still some big names set to report. Wal-Mart Stores, Inc. (NYSE: WMT) is one of them, set to report earnings before the open on Thursday, August 17. Options expiring on Friday, August 18, are available and could provide a low cost way to trade this earnings report. Wal-Mart has made a significant move on the day the company announces earnings in each of the last four quarters. On average, the stock has moved about 4% that day. We now know a big move in the stock is likely and we know there has been a downward bias in price on earnings announcement this quarter. The simplest strategy for traders to use would be to buy a put option. This would allow them to participate in the downside if it unfolds with predefined risk. However, there is no way to be certain that a down move will follow the announcement. To benefit from an up move, a call option could be bought. Or, to benefit from a move in either direction, a long straddle could be opened. The long straddle involves buying an out of the money call option and an out of the money put option, both with the same expiration date. This strategy can be used when a significant move in a stock is expected. This strategy can benefit a large move, without requiring the trader to form an opinion on the direction of the trade. 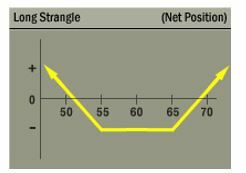 Like all options strategies, the long straddle is limited by time because all options have an expiration date. This strategy can be implemented when earnings are due since the date of that event is known. It provides potential gains based simply on the move. WMT closed on Monday at $80.70. An out of the money call is one that has an exercise price above the current price of the stock. An out of the money put is that has an exercise price below the current price of the stock. For Wal Mart, a straddle can be created by buying an $82 call and an $80 put, both expiring on August 18, the day after earnings are announced. The call is trading at about $0.80 and the put is trading at about $1.00. To open the trade, a total of $180 will be required since each contract covers 100 shares. This example ignores commissions because they should be quite small, just a few dollars, at a deep discount broker. When trading options, it will be important to select a broker that offers very low commission rates. As noted above, WMT has moved about 4%, on average, on the day it releases earnings. A similar move would result in a price move of about $3.25. On the up side, this provides a price target of about $84. On the down side, the price target would be about $77.50. Using those price targets, we can review the possible outcomes of the trade. Assuming WMT falls after the news, it could reach the down side target of $77.50. At this price, at expiration, the call option would be worthless. The put option would be $2.50. Since the trade cost $1.80 to open, this would result in a profit of $0.70 per contract, or a 39% return on the amount of capital required to open the trade. On the other hand, if WMT rallies on the news to the price target of $84, the put option will be worthless. The call option would have a value of $2, delivering a gain of $0.20 per contract based on the amount of capital required to open the trade. That represents a gain of 10% for a trade that will be open for less than one week. Although these potential returns may seem small, they are for a short term trade. If trades like this could be found once a month during earnings season, the potential gains on the amount of capital required to open a trade would be rather large over the course of a year. The risk of the trade is limited to the amount of money paid to purchase the two options. Even if WMT fails to make a large move, the size of the loss could be smaller than the amount invested, assuming one of the options retains some value. In a volatile earnings season, the long straddle strategy offers a way to benefit from volatility rather than attempting to make directional calls on trades. This could be appealing to risk averse investors who understand the difficulty of forecasting short term price moves.